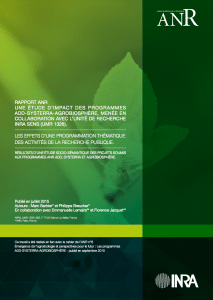 At the end of eight years of programming (2005-2013), the ANR (French National Research Agency) has initiated a reflection on the impacts of three successive research programs in agronomic science (ADD / SYSTERRA / AGROBIOSPHERE). 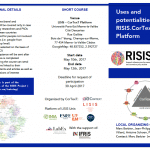 ANR has proposed the Inra-SenS unit and the CorTexT Platform to conduct an in depth-study of projects submitted and recipients of these programs. 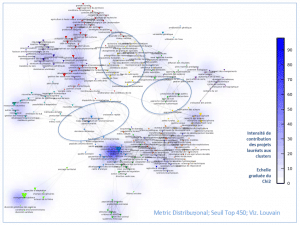 This study is first and foremost a characterization of epistemic dynamics and laboratories clustering based on the analysis of textual data from corpus of projects. To support such an analysis, a specific application has been design and developed to gather and organise information about project into a robust online content management system dedicated to the specificity of project description. 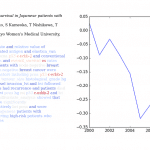 corresponds to a growing interest of science policy studies for the analysis of impacts of science programmation through specific area of knowledge identification. 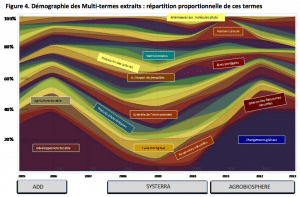 the emerging governance of agriculture, food systems and environment as a component of the earth system. They correspond to the emergence of a field of research on agro-ecology at the crossroads of a political incentive and of an endogenous dynamics of different disciplinary communities.